I'm not entirely sure what you're asking, Are you asking how to permanently rotate objects? What game are you trying to mod Mafia II into? I know I am deviating from the original topic which is 3d modeling; however, I wanted to know if you could make sense of the Animation_2.bin files. I am fully aware of their function, but I wanted to know if their true manifestation is similar to the FrameResource.bin files - 3d representation. It seems obvious that, like all animation files, it is represented in 3d format, but it seems that it is on another level compared to FrameResource.bin files. Is it possible to reach an understanding similar that of the FrameResource.bin files? It seems like I am the only person who noticed that the Beretta Model 38 does not eject shells in the game, nether does the M14 rifle once it substitutes a weapon via modification to the tables.sds. This can attributed to the naming of the the shell models - to my surprised, the shell models actually existed. 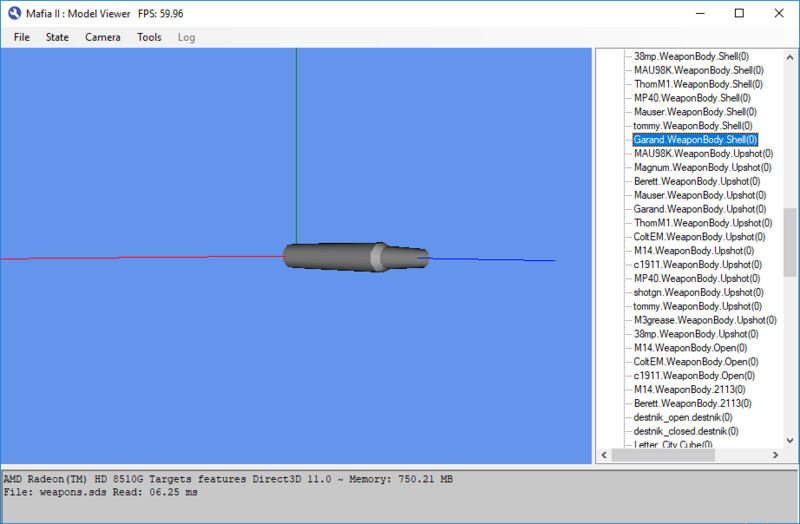 Although, similar to other weapons, the shell models are properly named in the FrameResource.bin, they are different from the other shell models (i.e. ThomM1.WeaponBody.Shell compared to Berett.WeaponBody.2113). The shells belonging to the Thompson M1A1 and the M1 Garand are similar in structure to those belonging to the Beretta Model 38 and the M14 rifle, respectively. However, what prevents the display of the latter weapons is the naming as I previously speculated. The number "2113" is in the place of "Shell". Instead of "Berett.WeaponBody.Shell", such model is listed as "Beretta.WeaponBody.2113" - this also applies to the M14 rifle. Are the names of the shell models belonging to aforementioned weapons the cause of their lack of appearance? Also, how would one be able to fix this issue? By the way, can you make sense of the Animation_2.bin files? How can one read them? enough response then perhaps it may reach the sticky stage. To think there was more cut content left by 2K in plain sight. Amazing progress guys and congratz on the sticky statz! As you can see, the numbers equal a bone name. So the names have to be named after bones or the game will most likely crash. 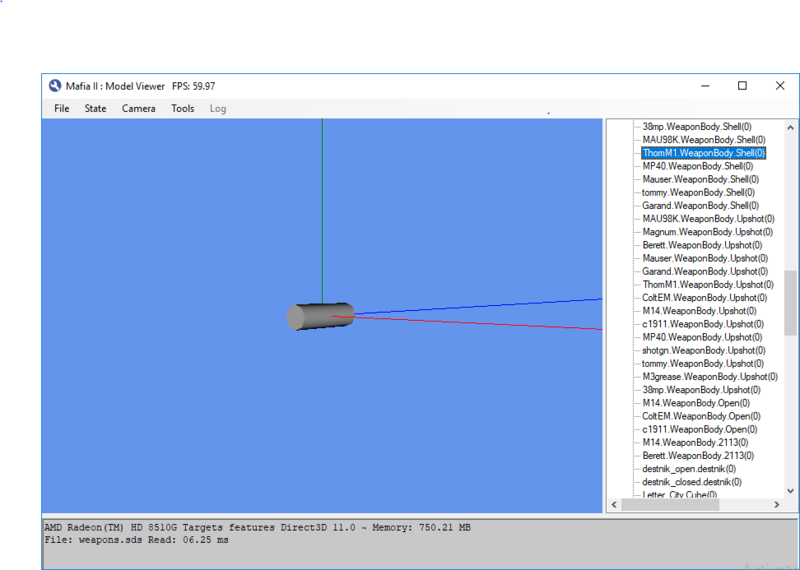 I did not create "model viewer", so I don't know it works. But the names on the side look like the "IndexBufferPool" or "VertexBufferPool" reference. I hope this helps. About Animation2, files. I know how they are structured but still ironing things out. The first part is the ID of the anim set and a hash of the animation. Then information of the root bone and the matrix, with a number of keyframes and bones after it. Oh and by the way, pretty much any collision file can be opened with the toolkit, but saving is still being worked on. Thank you for your reply, but I feel that it is no coincidence that the shells belonging to the only two weapons that eject no shells in the game are named differently. I have reason to believe that it is the cause to their absence. Can you fix this flaw? If the names on the sidebar of the aforementioned program are in reference to the IndexBuffer.bin and the VertexBuffer.bin then could the solution lie in those files? Also, where did you collect the information below and with what tool? I've been testing this with a few models. It seems to work really well but normal and tangent data is still incorrect, which makes the model look really dark in places. ,i remember downloading it a long time ago ,i think it was a 7mb rar file . It was supposed to be extracted to overwrite the first version of the tools. It might have fixed some probs. the first version had. Can't remember if it's still available on playgroundDOTru though. I probably have it somewhere on a dvd. ,not sure if it's the same one as the link on the playground mod page though it does seem to be smaller than the size posted on the mod page ,haven't been on the playground forum in ages. He is also computer programmer that creates programs that decrypt content in Mafia 2. He is very versatile, as he created programs pertaining to a variety of Mafia 2 files, e.g. sound, tables, stream map and actors files etc. Upon reviewing his creations, would you consider yourself to be of the same caliber as Yusik - are you capable of applying your skills as a computer programmer to the modification of various Mafia 2 files. It seems like you are highly engrossed on the 3d map of Empire Bay; I wanted to know if you capable of creating a program that could decrypt many files with content that remains unknown today - the Animation files, for example. I've already started on many files, the toolkit aims to reverse all file types, not just 3D. I'm only focusing on 3D data because adding a model into the game without using the car method hasn't really been accomplished yet. Any updates or new stuff to show Greavesy? Hey! Sorry for the lack of updates on MafiaScene. 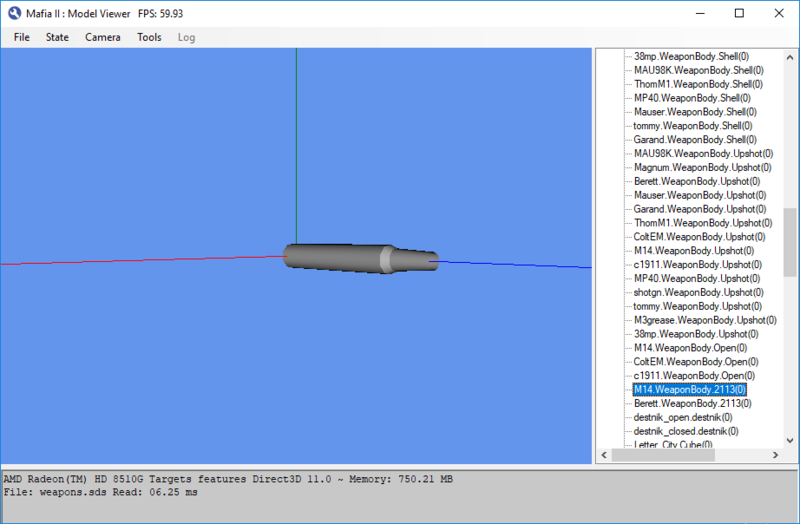 I've been working more on collisions and models. I've managed to reverse an APEX file type, speech data, actor data and make tools for both of them. I should be releasing an update in the next few days. tbth was a complete mishmash.